This is the second of a two part review looking at the hows and whys of replicating loudspeaker listening in headphones. The first part reviewed Daren Fong Audio's Out of Your Head software. This part looks at a combined hardware DAC and software combination, also designed to simulate listening to loudspeakers but for a different purpose. 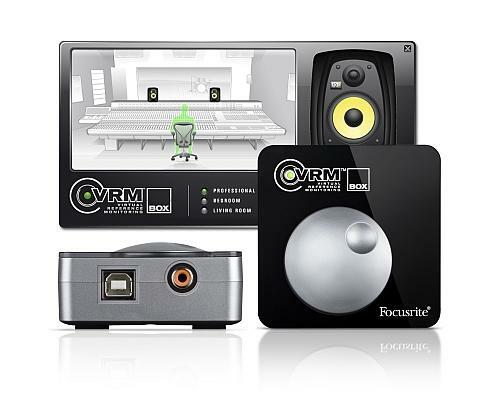 The Focusrite VRM Box is intended to imitate a range of different speakers in different acoustic environments to allow home recording enthusiasts or small studio owners, who may be forced to mix in headphones for practical reasons, to hear what their recording sounds like in different situations. VRM is an acronym for 'Virtual Reference Monitoring'. Mixing sound in headphones is always sub-optimum if the intention is that the final product will be listened to through loudspeakers. For the time pressed home recordist, setting the levels and equalising their masterpiece can be very time consuming. To do it properly and check how the music sounds with different speakers and in different acoustics requires copying the files to portable media and checking the sound in as many reproduction environments as possible to get the best mix. Well produced music needs to sound good in a classic hi-fi, certainly, but may also need to work effectively through TV speakers or in a car stereo. The VRM Box promises the ability to do this without leaving your computer. Focusrite presented a paper describing the technology to the Audio Engineering Society convention in 2010. Its extract gives a good description of impulse response modelling which was discussed at greater length in the last review. "Using a specially-designed test signal, the impulse response and directivity pattern are measured in a small recording room. A near-field measurement is also taken. An algorithm is presented for combining the near- and far-field responses in order to compute out the early reflections of the room. Doppler distortion can be calculated using recorded and measured properties of the loudspeaker. The result is a set of loudspeaker impulse and directional responses that are detailed enough for convincing auralization." 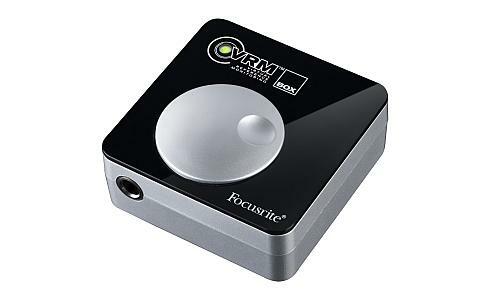 The VRM Box itself is a small USB DAC around 3cm square and two cm deep, topped with a convex volume control. The unit is made of plastic but feels solidly made and the volume control is very nicely implemented - smooth and easy to use. There are USB and coaxial SPDIF inputs and a quarter inch headphone socket. The box is designed to work with the dedicated PC driver software but it can also function as a USB DAC/headphone amp on its own. Used without the special software the box has reasonably good sound quality – pretty much what you'd expect from a generic device of this type at this price, albeit nicely made. The DAC claims to handle sample rates of up to 192kHz over its coaxial SPDIF input but I couldn't get that to work and, from closer review of the site, I think that "up to 192kHz" is achieved by downsampling in teh associated software to the DAC's native data rate of 48KHz. The USB input will deal only with 44 and 48kHz speeds. With the exception of the SPDIF issue, installation was straightforward and worked well for me. The box was immediately recognised as a USB DAC and the Windows software installation went without incident. Then it's just a case of launching the software and choosing the speakers and environment from the selection displayed. The software's graphical user interface is intuitive, offering pictures of the modelled equipment and environments. It scores over the Out Of Your Head software in that regard, offering a more sophisticated and user friendly interface. The basic DAC sounds fine. With a dynamic range of 103dB it is typical of a modest 48 kHz USB DAC and headphone amp. The sound is fairly open and detailed but without the weight and definition of higher end DAC and amplifier combinations. With the software in circuit, the recreations of speakers and acoustics are pretty credible. I am more familiar with the type of hardware reproduced here than the high end speakers in OOYH. Images do lose a little definition – just as they do listening in room rather than in cans. I also found a general effect whereby the centre of image seemed firmer than usual as peripheral sounds are a little blurred by the acoustic modelling. But overall, switching to studio monitors did bring out the crisp and accurate sound of decent studio monitors and the domestic settings softened these to more conventional listening. It wasn't clear that these were effects I'd want applied to my music for regular listening, but that is not what the VRM box is designed for. The bypass worked better than with OOYH - the volume level remained the same so it was possible to switch the processing in and out to compare directly. In the spirit of thoroughness I tried to mount a direct comparison with the OOYH by running the OOYH software through the VRM Box DAC. For reasons that still escape me, I couldn't get the software to work with the VRM box. So that will remain a mystery. Although it uses the same underlying technology as OOYH software the VRM Box is a very different proposition. I used the unit for monitoring tracks on the mixdown of a recent demo. It certainly improved on simple headphone monitoring but could never wholly replace listening to the sound in multiple environments. Nevertheless it did challenge my mixing and mastering skills to come up with more professional results. In summary, it's a good value little DAC if you can live without higher bit rates and is very practical for its intended purpose. From a wider perspective it seems clear to me that growing use of computer techniques is introducing concepts that have massive potential to improve the sound of digital audio. The digital amplifier manufacturer Devialet has recently introduced a digital effect designed to optimise the audio stream for specific loudspeakers. It would also be possible to use impule response approaches to give character to digital amplification by modelling the effects of analogue electrical circuits. This is already done extensively in the professional music scene where the latest top end digital guitar amplifiers are capable of wholly convincing emulations of classic valve amplifiers. Perhaps we might even come full circle by using digital to imitate the qualities of vinyl. Of course - we could just go and put a record on (think I'll do that now)!